The block is finished off with a Navcam line of sight (LOS) observation to continue monitoring dust in the crater as the optical depth slowly wanes. The Navcam LOS differs from the other dust-monitoring observation, the Mastcam tau, by looking at the amount of dust in Curiosity's line of sight to the crater rim. The Mastcam tau determines the amount of dust in the entire atmospheric column by looking at the Sun in a controlled and protected way. The sol continues with a drive to the new workspace where contact science will be planned over the weekend, and ends with an over-night cleaning of the SAM "scrubbers" and "getters" in preparation for the SAM noble gas experiment in the early hours of sol 2159. Sol 2158 is spent sleeping and recharging, with only REMS environmental monitoring taking place. After charging up the batteries, Curiosity will wake up in the wee hours of 2159 to run the noble gas experiment that will hopefully constrain the geochronology of the "Quela Doggie Bag" sample. 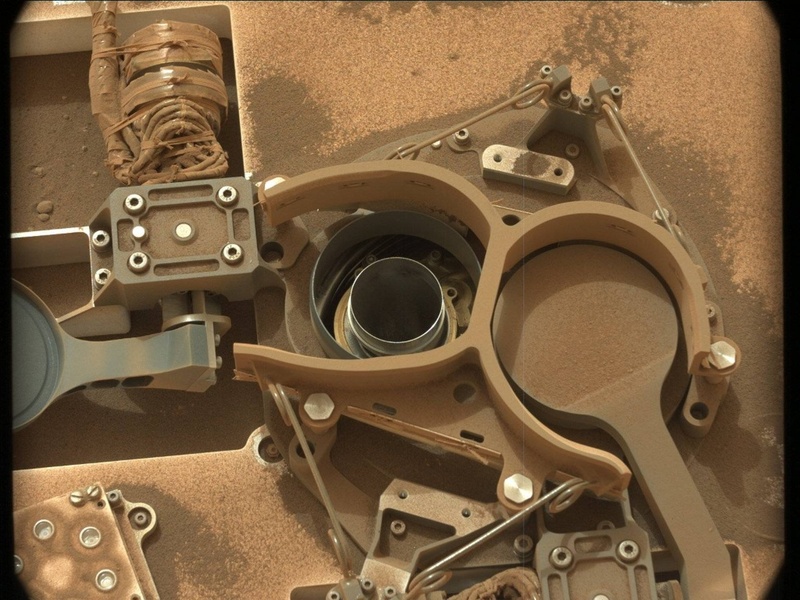 Curiosity has actually been carrying these "Quela" leftovers from drilling that took place close to the Murray Buttes for almost two Earth years - appetizing, right? In fact, the sample is in a perfect state to be run through the noble gas experiment, which will help team members understand how recently the outcrop has been exposed from beneath eroding rocks. The Murray Buttes have been retreating due to erosion - but at what rate? Hopefully this experiment can help clue us in.